What Are The Rheumatic Heart Disease Symptoms? Home > Heart Diseases > What Are The Rheumatic Heart Disease Symptoms? Rheumatic heart disease is a group of long-term and short-term acute or chronic heart disorders occurring due to rheumatic fever. When permanent damage of the heart valve is caused due to rheumatic fever, it is known as rheumatic heart disease. Rheumatic fever can be taken in the form of an inflammatory problem affecting the connective tissues of the human body. Almost any individual can suffer from rheumatic heart disease. Rheumatic fever can cause wide scale damage to each and every part of the heart which includes the inner lining, the valves and the outer sac. Rheumatic heart disease symptoms in people tend to be different from person to person. The symptoms might be experienced differently by every person. Symptoms generally start showing between one and six weeks. 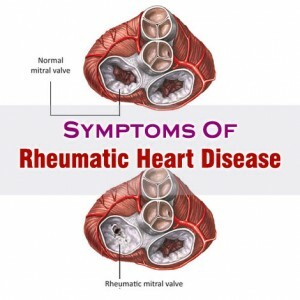 Symptoms of rheumatoid heart disease in its advanced stage include heart palpitations, chest pain, thumping sensation felt in the chest and swollen stomach, wrists and ankles. The symptoms in the advanced stage might also not be very clear and therefore proper diagnosis is very important. Other noteworthy symptoms of this condition include fainting or syncope, stroke and fever associated with damaged heart valves and infection. These symptoms need to be taken care of and treated immediately in order to avoid complications.